During a single month in the fall of 1831, a 52-year-old woman named Frances Milton Trollope—Fanny—labored feverishly over a book in a rotting Middlesex farmhouse. She cherished the hope her work would somehow extract her and her family from the grip of poverty. She had no experience as an author. Nothing in her past gave any hint that her writing would do anything but sink unremarked into obscurity. Instead, a miracle occurred. Domestic Manners of the Americans became an instant, runaway success, a travel book like no other. Although the term “best seller” would not be coined for another half century, some authors were already experiencing strong sales and public acclaim. In Fanny’s day, the public measured literary accomplishment in how many editions a book went through and how fast those editions flew out a bookseller’s doors. 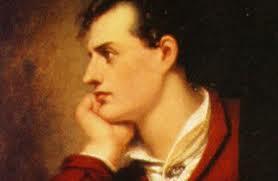 Walter Scott, James Fenimore Cooper and Lord Byron were the John Grisham, James Patterson and Stephen King of their time. The reading public knew these authors and waited impatiently for their latest works, whereas Fanny Trollope was anything but a household name. So it was even more remarkable that Domestic Manners, by a wholly unknown author, went through four English and four American editions in the first year alone. Shops could not keep books stocked. Domestic Manners beguiled the reading public. 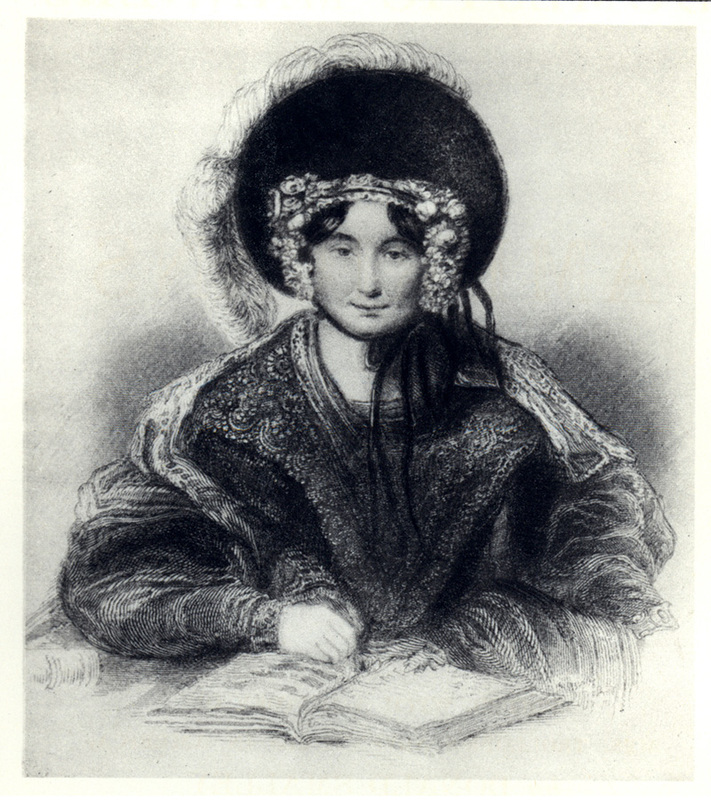 Fanny Trollope suddenly found herself among the most well-known figures of the day, feted, celebrated and wealthier than she had ever known herself to be. In her first year as an author, she earned six hundred English pounds, over a hundred thousand dollars in today’s money. Fanny Trollope has almost totally faded from the intellectual tapestry of this country’s history — for one thing she is overshadowed by her novelist son Anthony — but to my mind that makes her only the more fascinating. Fanny’s Domestic Manners of the Americans captured the strange, sharp-cornered realities of the bold new Jacksonian landscape of the United States. Four-hundred-and-six pages long, divided into thirty-four brisk chapters, featuring twenty-four Hogarthian illustrations in pen and ink (done by a traveling companion/protector/lover), the book took readers from Cincinnati, a boom town on the western frontier, to the raw northeastern spectacle of Niagara Falls. 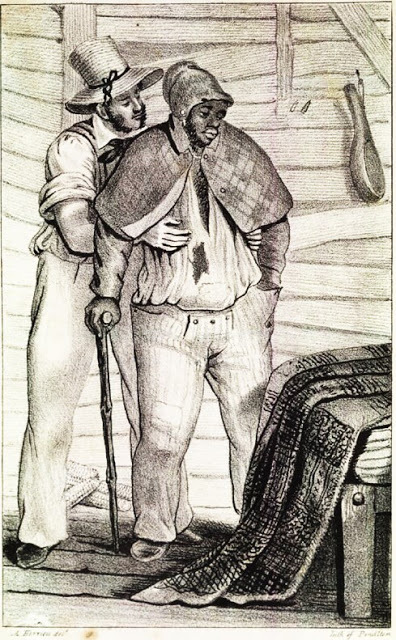 The author clearly hated aspects of what she had encountered in the new nation, the myriad social injustices, the denigration of women, the racism, the low taste, the filth. But Fanny Trollope loved the boundlessness of this fresh terrain. Its possibilities tantalized her, its contradictions stimulated her thinking. 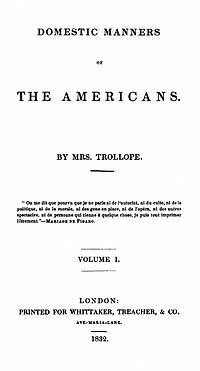 With this work, she opened a window upon an aspect of the United States that had never been treated before, certainly not by Tocqueville, her contemporary. For Fanny concerned herself with the everyday, the mundane, the overlooked details of American life. Readers loved getting a peek behind the supercilious, jingoistic façade to expose an earthier reality, its table manners, social niceties (and not-so-niceties), its mundane days and ways. Domestic Manners of the Americans was, beyond anything else, written with a female’s eye. During the course of her travels, Fanny’s shambolic entourage included her three hungry, ragamuffin children, two chronically unpaid servants and—much to the consternation of prudish observers—the French artist confederate who was her constant companion. Her arrival in Cumberland, say, a small outpost in the state of Maryland, or perhaps Wheeling, Virginia, or Washington, D.C., invariably injected a blast of the outlandish into struggling, hard-scrabble realms. The Trollope circus had come to town. At the head of the troupe was Fanny herself, an eminently likeable but unlikely heroine, a crone Cinderella (fifty years, in that time period, qualified a woman for crone-dom), one who would play her own fairy godmother and totally transform her life. To strangers Fanny presented a strange, almost disturbing vision: a middle-aged woman with bad teeth, growing thinner by the minute via the vagaries of starvation, totally on her own, with nary a guiding male hand in evidence (a French artiste? Who—or what—was that? ), loud, flamboyant, all over the place, rampaging across the rough and tumble world of the frontier. 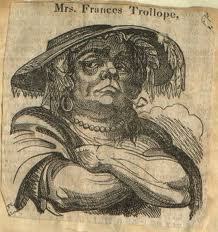 Fanny Trollope took her place as the first among a troupe of European critics of the American scene. Other observers crossed the ocean around the same time as she did, men already possessed of fame, Tocqueville and, a little later, Dickens, making their tours, literary beetles crawling across the flank of the Republic, picking at its scabs, inspecting, interpreting, judging. Fanny, perhaps more than the others, got the details right. When Fanny toured the U.S., one thing she hated (she also despised slavery, sexism and Andrew Jackson’s vanquishing of Native Americans from their homelands) was the manners of its menfolk. The men returned the favor. One gentleman described Fanny as “singularly unladylike,” labeling her “robust and masculine” and critiquing her long walks in the pouring rain or midday sun. She was, another noted, often sarcastic. 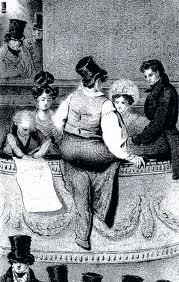 After Trollope’s visit, a “trollope” came to mean any kind of behavior the writer had lampooned–for example, the widespread practice of gentlemen hocking streams of yellow tobacco juice in their elegant theater boxes, a particular bugaboo she had. I think we should bring the term back. Fanny was the original snark, and there’s a lot to be snarky about today. Anthony had strong negative feelings toward his mom — she didn’t take him along on the grand adventure, after all — and I think there was a lot of competition going on there. Bold as brass about sums Fanny up — I really want to time travel back and visit NYC with her. Jean, that was so lovely and interesting. I went on a Trollope (Anthony) tear last year, and read all the Palliser novels. They are both crappy and wonderful, with a slew of recurring plotlines and character types, which makes them all the more fascinating and limited, obsessive and formulaic at the same time. One of the character types is the American wildwoman who almost manages to snare a besotted, indolent English aristocrat. She is usually brown as a nut, with flashing eyes and flashing temper, bold as brass. I don’t know how she links up with ol’ Fanny, but it would be fun to spend a bunch of hours connecting the two! I think it went a little further than like. That young French artist made a lovely picture of her… he must have liked her! She doesn’t look like Old Madame Vinegar, there. How I would like to write one!